The premise of the new CBS comedy The Neighborhood is that a young white family has moved into a predominantly black neighborhood. The show hopes to earn laughs by delving into this situation and showing the cultural disparity between the new residents and the community. 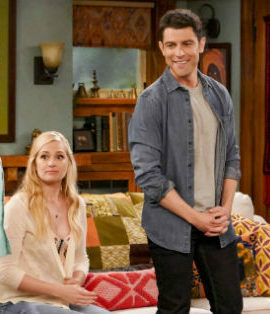 Despite the best efforts of the cast (especially Max Greenfield, who was so memorable on Fox’s New Girl), this show fails to offer little more than its concept implies. Greenfield stars as Dave Johnson. He and his wife Gemma (Beth Behrs) move into their new neighborhood with their young son Grover (Hank Greenspan). Their next door neighbors are the Butlers. Tina Butler (Tichina Arnold) is a kind-hearted and sweet neighbor but her husband Calvin (Cedric the Entertainer) is a grump. He doesn’t like the idea of a white family living next door. This moment provides a nice ending for the pilot but aside from that sequence, the show just settles with its one-joke premise, emphasizing again and again the cultural differences between the neighbors. For instance, Marty Butler (Marcel Spears), the Butler’s other son, notes that if the Johnsons don’t attend a neighborhood barbecue, they will seem racist. Marty notes that “Black people can’t be racist.” During a neighborhood barbecue, Malcolm notes that Dave can’t refer to their neighbor across the street as a crackhead. Calvin insists that there are two types of racists: “ones who hate black people and ones who love black people.” He believes that Dave is one of the latter and seeks to prove it throughout the episode. Both Cedric and Greenfield seemingly give their all to the show with Greenfield really showing off his comedic sensibilities in the first episode. However, the program only seems to offer one side of the characters. It doesn’t use its concept as a starting point. It uses it as a crutch, relying too overtly on its set-up and settling for superficial jokes. The comedy’s cast is undeniably gifted with Greenfield and Cedric clearly deserving of shows that use their unique talents well. The Neighborhood, though, feels like a letdown for both of them. In the weeks to come, the show could develop its own voice and create more of a great dynamic amongst the cast but it feels limited right now by its premise.